SMELL the roses and change a life today. Regional residents can jump on board 65 Roses Day to help raise money and awareness of cystic fibrosis. One baby with the genetic disease is born every four days in Australia. Without a lung transplant, many who have the disease will die from complications by the time they are 40 years old. The Australia-wide fundraiser got its name in 1968 when a boy thought his mother said 65 roses, not cystic fibrosis. Cystic Fibrosis Queensland CEO Cath Parker said participants could do 65 things to raise money. "It's amazing to see how everyone interprets the 65 roses challenge," Ms Parker said. "This year, people have been really creative with a 65 book reading challenge for a seven-year-old, baking 65 cupcakes and a 65km relay swim. 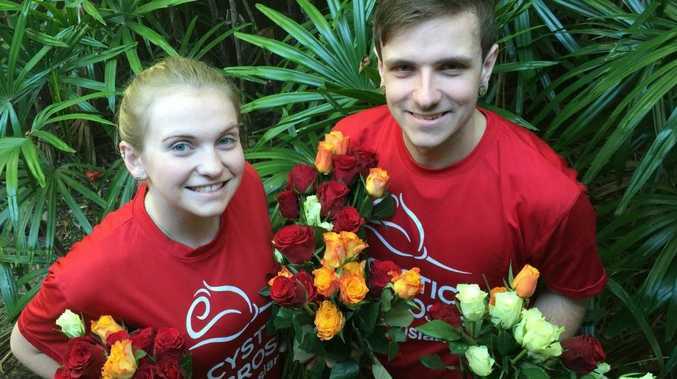 "65 Roses is also a great time to increase the awareness of cystic fibrosis and its impact on individuals, families and the community." Volunteers will sell $5 roses on 65 Roses Day. "No point in asking why, all you can do is carry on"